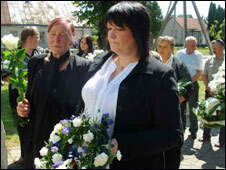 The gruesome murder of Jolanta Bledaite united communities in Scotland and Lithuania in grief. There was horror in the Angus towns of Arbroath, where her body parts were found, and in Brechin, where the 35-year-old was killed in her rented flat. People mourned for her at a memorial service and raised thousands of pounds for her desperately poor family. But the grief was greatest in the Lithuanian town of Alytus where Jolanta had lived. Ms Bledaite's father, Sarunas Bleda, had been suffering from cancer and passed away the day before Aleksandras Skirda admitted killing his daughter. Arbroath woman Sue Smith, who supports the migrant community in the area, travelled to Lithuania and liaised with Ms Bledaite's family as they struggled to cope with their loss. 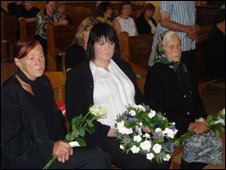 Ms Smith said: "When I took her remains back to Lithuania for her funeral her father came to the grandmother's house to see the coffin. "He collapsed that day and there were no medicines there, they were actually giving him baby vitamin drops to try to give him strength to get back on his feet. I realised how poor these people were at that point. "He was taken home to his bed and a doctor was called and he never ever got out of bed again after that. "I think it was just too much for him to see her coffin. I think for him, he realised when he saw the coffin that it was really true." On one of her visits to Lithuania Ms Smith collected pebbles from the garden of the home where Ms Bledaite had grown up. 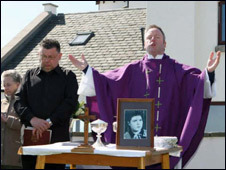 Those stones were scattered on the beach at Arbroath - where Ms Bledaite's head and hands were found - during a memorial service which was attended by about 200 people. Ms Smith said: "Everybody wanted to show that Arbroath's not a bad place, and neither is Brechin. "This is a thing that happened that was horrific and I think people came because they wanted to show her family that people did care. "Her family are very thankful to the people of Brechin, Arbroath and the whole of Scotland for the support they got at a really difficult time." Ms Bledaite had been a farm worker raising money to buy a house in Lithuania and support her family. She had carried out work at Gask Farm sorting potatoes. Owner Robert Lumgair said: "As a person she was shy, she was very polite. Every morning she would give everybody a smile and a good morning to everyone. "When we heard about it we just couldn't believe it because Jolanta was shy, quiet and you could never imagine her getting involved in anything at all. "You just imagine her going back to her flat to read a book or whatever. That's the way she was, she wasn't one to spend money. "Jolanta is missed very much. Every morning you still come into the shed and you always look right where she stood every morning. She always had a nice pleasant smile." Ms Smith hopes that now the trial is over people can start to put the horrific crime behind them. "For the sake of the community we have to move on," she said. "These things sadly happen all over the world but when they happen in a small place like Arbroath it comes as a big shock. "I think we just have to continue building the community, show people we're not like that. "I don't want people to get beaten by this type of crime."